This pepperoni pan pizza is the real deal–homemade dough, homemade tomato sauce, two types of mozzarella, Parmesan cheese, and spicy pepperoni with a kick. Mangia! 1. Dump the crushed tomatoes into a nonreactive container. Push the garlic through a garlic press directly into the tomatoes. 3. Preheat the oven to 500°F (260°C) or, if possible, 550°F (285°C) with a rack in the middle position. Slick a large, heavy, rimmed baking sheet or a cast-iron skillet or a 9-by-13-inch baking dish with 2 tablespoons olive oil. 4. Stretch your dough to fit into the pan that you’re using, first lining it with a sheet of parchment paper if you desire. Spread the tomato sauce over the dough and top with both mozzarella cheeses. Lay the pepperoni over the cheese. 5. Transfer the pizza and baking sheet, skillet, or dish to the oven and bake until golden brown and crisp, 11 to 12 minutes. 6. Finish with a drizzle of olive oil, the oregano, and the grated hard cheese. Transfer to a cutting board, slice, and devour. 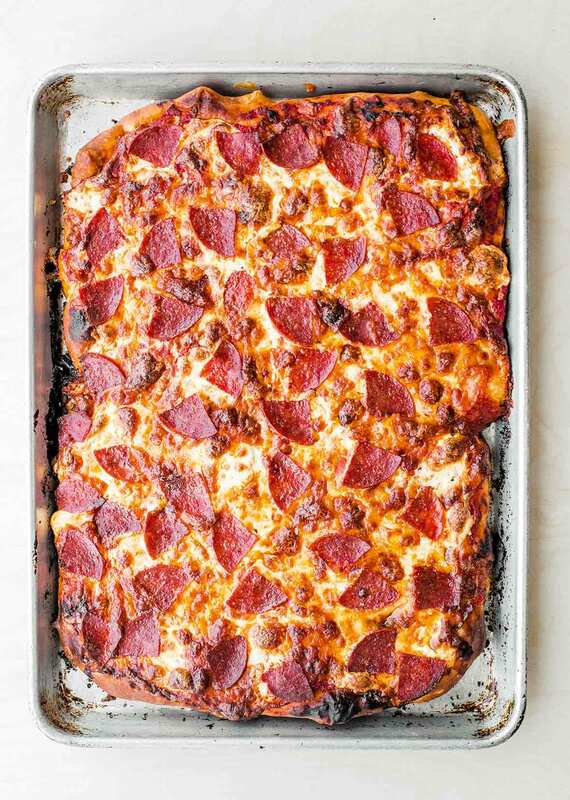 Sometimes, the crust makes the pizza, but for this pepperoni pan pizza, the sauce makes it. The key is good tomatoes. Because the sauce isn't cooked until it's on the pizza, good tomatoes are key. And they deliver a rich freshness that really sets it apart. And, of course the hint of garlic and olive oil don't hurt a bit! Since I had a ball of homemade pizza dough already in the freezer, this recipe was a breeze, but even if you don't, it's pretty simple, particularly since you don't have to cook the sauce for hours. The key is to get the crust nice and thin so when it goes in the hot oven, it crisps up nicely. And of course the bite of the pepperoni is a perfect offset to the three cheeses. The lessons? You never have to use store-bought pizza sauce again. And a delicious pizza dinner doesn't have to take forever. Our family loves homemade pizza so we were excited to try this pepperoni pan pizza. I especially loved the method for making the sauce. I made a few tweaks to the proportions, but I think this is an easy recipe for homemade pizza. I have my own dough recipe, so I need not use the one in the link. This pepperoni pan pizza has lots of flavor for a family-friendly meal that’s simple to prepare with store-bought ingredients. We used store-bought dough and Muir Glen crushed tomatoes. I was a bit surprised about the recommendation for crushed OR whole canned tomatoes as the crushed tomatoes here come in a thick puree while whole tomatoes come in juice. So whole should give you a fresher taste but perhaps too much liquid. I may try again with whole tomatoes to see if there is a big difference. I used an 11-inch (bottom measurement) cast iron pan. No clean up except for a few charred bits of parchment to throw away. Pizza slipped right off of parchment onto cutting board. Shockingly easy. Loved the combination of fresh and shredded mozzarella although the fresh mozzarella did give off a bit of liquid. I tilted the pan 45 degrees at about 7 minutes and the liquid came off the side of the dough and sizzled away. Both of my kids (one of whom eats almost nothing) really liked this pizza, so much so that I went ahead and made a second one as soon as we finished the first. We added dried oregano and finely grated Italian pecorino. I put Aleppo pepper on mine, no red pepper for the kids. Recipe refers to a cast iron skillet, so I used that. I think the heat retention of thick cast iron helps crisp the bottom crust, so I would recommend that. Since canned tomatoes make enough sauce for 4 pizzas, could easily make 4 pizzas for a bigger crowd with just 10 minutes to wait between each pizza being done unless you had more pans. Let me begin by saying, I ADORE pizza. I have made all types of doughs and sauces and baked them every imaginable way. I have cooked them atop the stove in cast iron, in a wood-fired oven, even a microwave. I have used nearly every topping, exotic and ordinary. I have angled my compulsion toward VERY elaborate sauces. My findings are very straightforward. Simple is ALWAYS best. This pepperoni pan pizza, at first glance, is nothing out of the ordinary, which is precisely what makes it a winner. The sauce, being just 3 ingredients and a pinch of salt, is simple perfection. I have used it with several crusts this past week including a pretzel crust from this pretzel roll recipe found on Leite’s and My go to pizza dough recipe. This simple, earthy pizza will be a staple in your repertoire till the end of time. We tend to eat what some refer to as California-style pizzas. 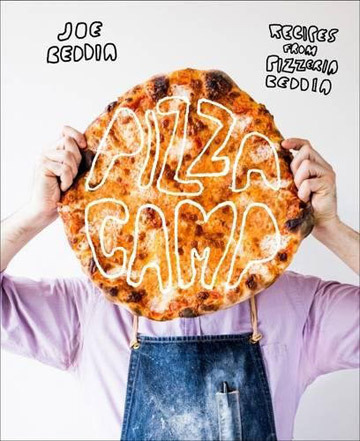 Some of our favorite pizzas that we order are a “white pie” with feta cheese and slices of tomato and zucchini, a pesto pie with chevre, seasonal pears, prosciutto, and herbs, and a pizza with sun-dried tomatoes, caramelized onions, olives, and mozzarella. All of them have thin, crispy, crust. Not at all like this particular pizza. What surprised me was just how much we liked it. I had not had a piece of pepperoni pizza for umpteen years or so, but after tasting this pizza, I will be having one again very soon. This is a very easy pizza to make. I used a 1-pound bag of pizza dough from Trader Joe’s. This is a very nice alternative to making your own dough. You do have to let the dough sit for about 15 to 20 minutes at room temperature, so that the dough doesn’t spring back and make it difficult to fill the pan, but you can let the dough sit while you are making the pizza sauce. I loved this pizza sauce, and this is coming from someone who always makes her own pizza sauce. (And I have always thought that my own pizza sauce was about as good as it gets.) This sauce is very easy to make, and if you use very good tomatoes, you are rewarded with a fabulous sauce. I had enough pizza sauce left to make 3 containers of sauce to vacuum seal and freeze so that I just have to defrost 1 to make my next pizza. My pizza did not look like the photograph, because I used our mondo, amazingly HUGE (14-inch) cast iron pan. Step 1. of the recipe instructs you to oil your cast-iron pan. The cast iron was the way to go. The crust turned out brown and crisp. This pizza was so large that it could have fed 6 people. We had a lovely salad with it for 2 nights and then enjoyed the rest at lunch the last day. I also found that the pizza reheated beautifully. I have a great toaster oven that has a pizza setting. The crust got extra crispy, and the ingredients melded together and melted into each other even more than they had originally. Total yum! Pepperoni Pan Pizza Recipe © 2017 Joe Beddia. Photo © 2017 Randy Harris. All rights reserved. All recipes and photos used with permission of the publisher.